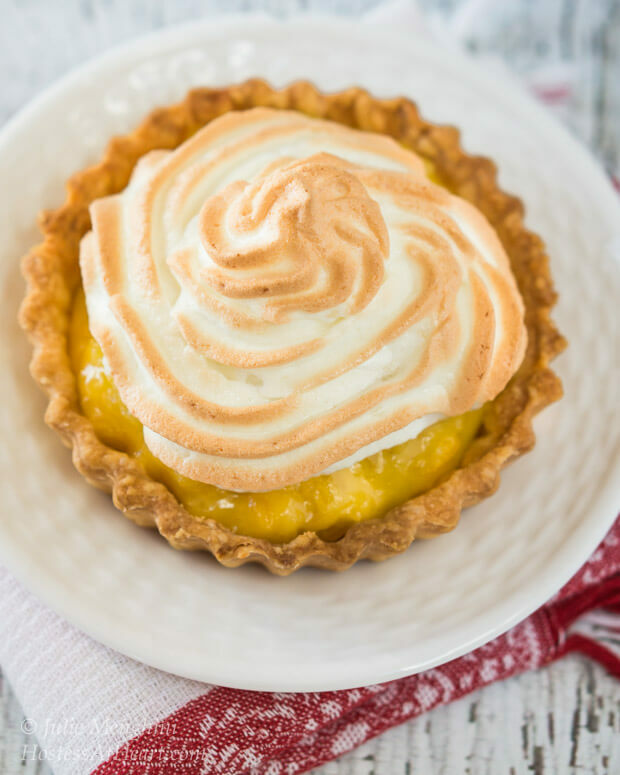 Pineapple Cream Meringue tarts have a smooth and luscious filling that sits in a buttery, flaky crust. The whole thing is topped with my no-fail meringue. A lot of people don’t care for Valentines Day. I LOVE Valentines Day. It is a happy occasion that reminds me how lucky I am to have met my husband at the ripe old age of 19. We don’t go out for dinner or buy each other extravagant gifts on Valentines Day, and sometimes we choose to celebrate on the weekend if the actual day falls within the week. Our celebration includes a great dinner that we cook together and a bottle of wine. 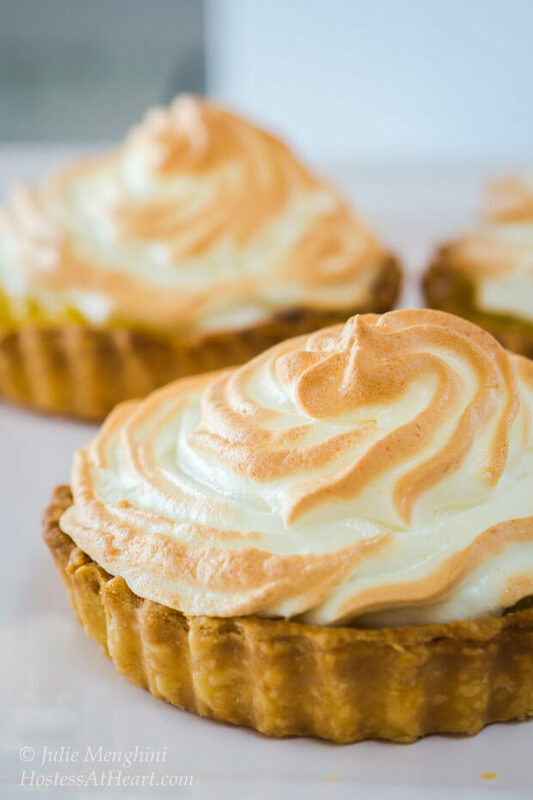 By now you know that I probably bake a treat for the occasion too, like these Pineapple Cream Meringue tarts. I love making John special desserts for occasions like this one. This pie is what he requests for his birthday every year. I had these little tart shell pans that I had purchased and had never used, so I made it into tarts. I used the crust that I learned to make in Pie School. Then loaded in some thick juicy pineapple filling and topped the whole shebang with a thick layer of toasted meringue. What’s not to love? This recipe was handed down to me by my mother-in-law (MIL). The meringue technique is like none that I’ve ever used. I’ve never had it fail, so if meringue scares you, this recipe is for you. I got 4 large tarts out of my pie crust and then just filled little dishes with the leftover filling and topped them with meringue, without crusts. If you used two crusts, you would easily have 8 large tarts. 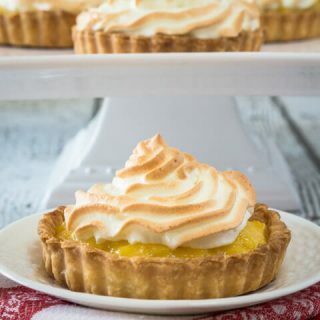 Pineapple Cream Meringue tarts have a smooth and luscious filling that sits in a buttery flakey crust. The whole thing is topped with my no-fail meringue. In a small sauce pan, mix cornstarch and cold water. Stir in boiling water over medium heat and boil for two minutes. Remove from heat and set in cold water or refrigerate to cool while you prepare the crust. Place 1-1/2 cups of water in a liquid measuring cup in the freezer. You will not use it all, but it's better to have more than not enough. In a large bowl, combine flour, sugar, and salt. Cut cold butter into 1-tablespoon sized pieces. Toss them into the flour. Scoop up flour and butter and rub between your thumb and fingers, letting it fall back into the bowl. Do this until you have a crumb that resembles rough cornmeal with pea and almond sized pieces. Remove water from the freezer. In a circular motion, drizzle a small amount of water in a circular motion into the flour mixture to the count of five. Toss the water through the flour with your hands until you no longer feel wet spots. Repeat until dough is shaggy and slightly tacky. Press an egg sized ball together. Toss it in your hand a couple of times. If it breaks apart when you catch it, add a little more water. If it retains its shape you're done. Gather the dough in 2 roughly even discs. Wrap each disc in plastic wrap and refrigerate for a minimum of 1 hour. If you only use one crust, the other one can be wrapped and used within 3 days, or frozen. Remove pie dough from the refrigerator. On a lightly floured surface, cut each disk into 4 pieces and roll each piece of dough out from the center to the edge until the dough is large enough to fill your tart shell and about ⅛ inch thick. Turn as you roll, always pushing out away from yourself. Press dough into shell gently. Use your rolling pin to remove excess dough overhanging tart shell. Repeat with remaining tart shells. Pierce the bottom of each shell with a fork, turning slightly. Place a piece of aluminum foil into each tart leaving the edges of the foil standing and not overlapping the edges. Fill with pie weights or dry beans. Bake at 425 degrees F for 10 minutes. Remove the tarts from the oven and pick up the edges of the foil and remove with weights. The foil will cool immediately. 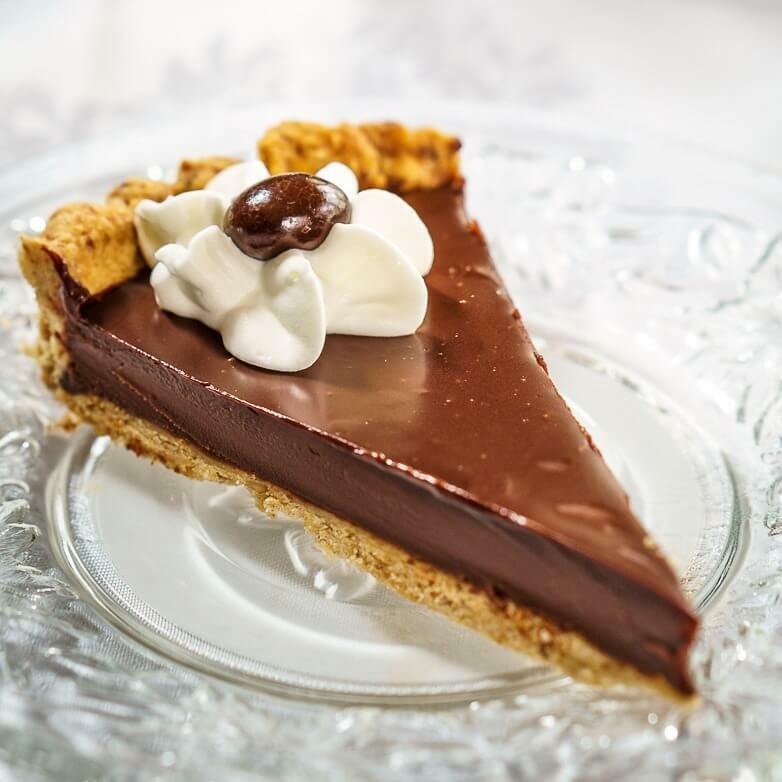 Reduce the oven temp to 375 degrees F and continue baking for 15 minutes or until tart shells are browned. Remove to a cooling rack to cool completely. Prepare the filling. In a medium sized sauce pan, combine flour, sugar sour cream and pineapple. Cook over low heat stirring continuously until thick. Don't neglect because it can thicken all of a sudden. Blend in egg yolks, stirring continuously, and cook for 2 more minutes. Add vanilla and cool. Finish Meringue. In an electric stand mixer, fitted with a whisk attachment, add egg whites and beat on medium high until they start to form soft peaks. Add sugar one tablespoon at a time and vanilla. Continue beating until strong peaks form. Add cornstarch mixture and beat until blended. Don't over beat or your meringue will start to break down. Place tarts on a baking sheet and fill each shell 3/4 full with filling. Top with meringue by the spoonful or you can use a pastry bag. Bake at 375 degrees F for 5 minutes or until peaks are golden. Be careful not to burn. Completed tarts should be refrigerated until serving. 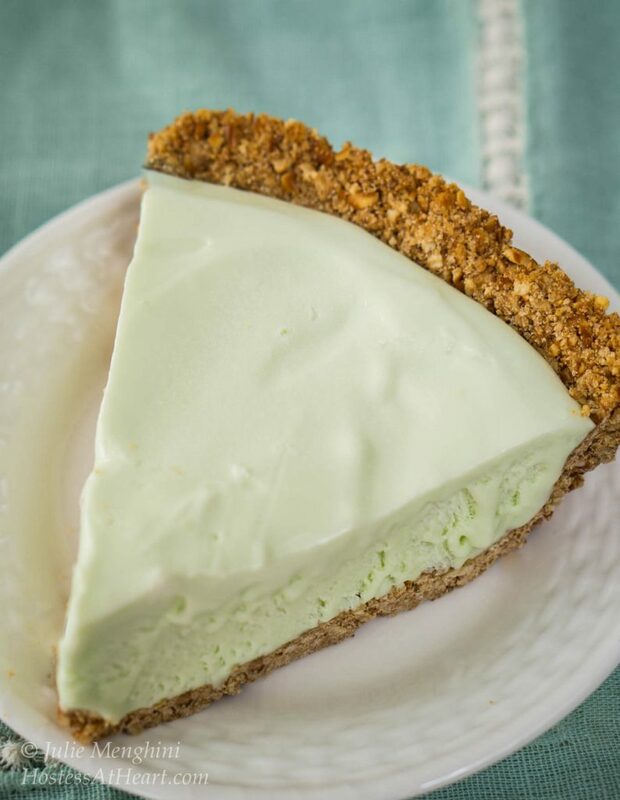 If you are in the mood for other creamy dreamy pies, here are a couple more great recipes for you! p class=”p1″>Let’s keep in touch! You can find me on Pinterest, Instagram, Facebook, and Twitter! Better yet, enter your email address in the box below and never miss a recipe! We don’t get all gushy on Valentine’s Day and I love that you didn’t make something chocolate! BTW, where can I go to pie school?!?!?!? These are super cute! Love that pineapple flavor! Oh, these are so pretty and so lish-looking! I’m tempted to go buy some mini tart pans for this recipe. Pinned, and I can’t wait to try it! Thanks! Ginger, thank you so much! I appreciate your sweet comments. If you try them, stop back and let me know how they come out. 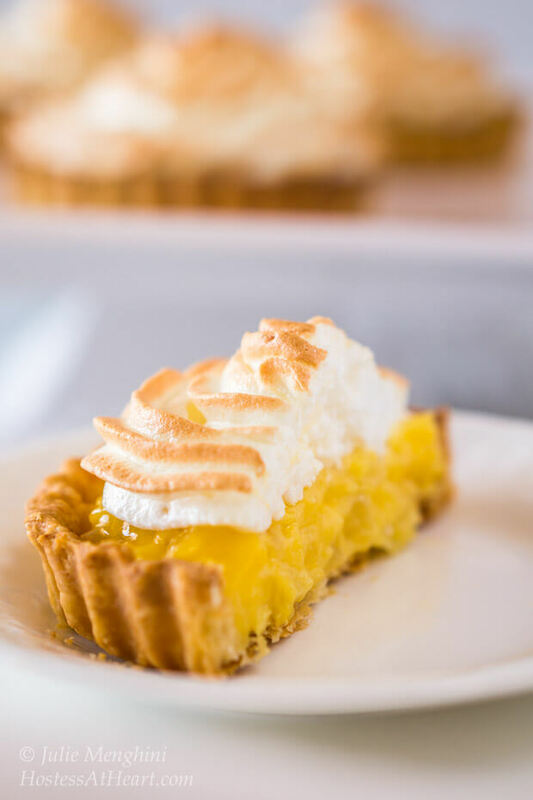 This pie is pure perfection with that gorgeous and beautiful meringue on top! The filling the just how I like it to be, creamy and nice! This is something I would love to try very soon, now I can’t stop thinking about it! Thank you dear Shadi! It is definitely a treat that we love. If you try it, please let me know what you think. This is the first time I made it into mini tarts. It’s just as yummy as a pie. What a gorgeous pineapple filling…I would eat at least two of those beauties. Thank you Sandi! I appreciate you stopping by! Julie, these sound perfect. There’s nothing like homemade meringue. I’ve not come across that technique before, so now I’m tempted to give it a go. I love the switch from lemon to pineapple too. Thank you Jane! The technique was strange to me at first, but it really helps hold the integrity of the egg whites. These tarts are awesome, Julie – feels like summer! And that meringue looks amazing! Thank you Michelle! 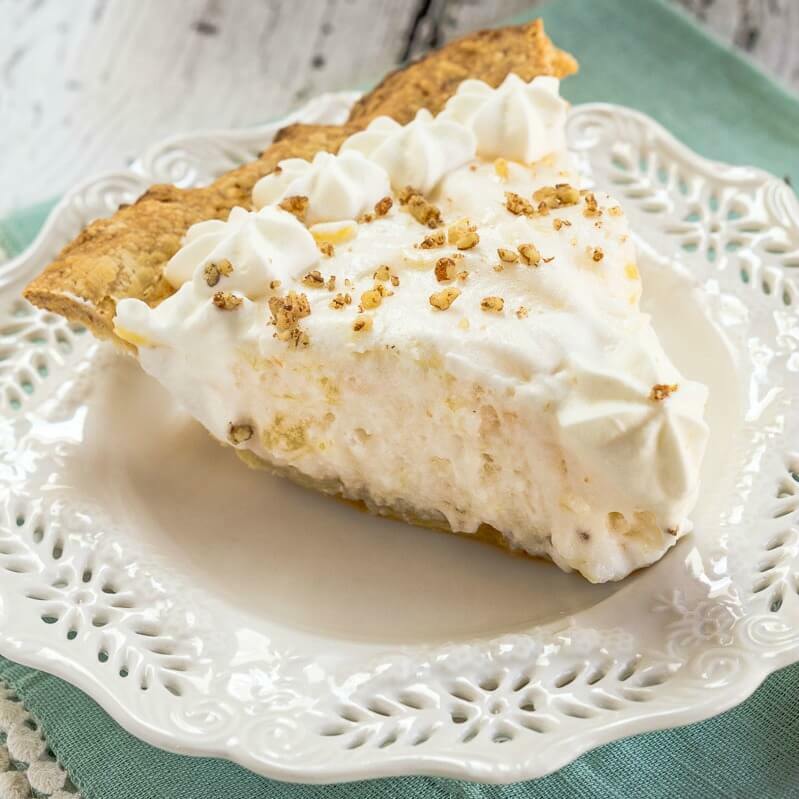 John loves meringue, so this pie is always a great treat for him. I’ve been looking for a recipe to try out my new mini tart pan… and this is the one! So beautiful! Thank you Amanda! New kitchen toys are the best! Not only are these little guys gorgeous but pineapple… YES. I LOVE all things pineapple and I think that there aren’t enough pineapple desserts in the world! Yum!! Thank you Tracy! I say yes to more pineapple desserts! Thank you Ivette! Thank you for stopping by! Did someone say pineapple?! Make way, people, make way! These are all mine, lol. You know I have a thing about pineapple. Definitely making these! Thank you Angie! Perfect for my pineapple friend! These look wonderful and such gorgeous photos!! Thank you Anna! Very yummy and you are a sweetie to comment on the photos! Thank you! I wish it was easier to share. I’d have so many friends at my virtual table. Oh Kaila you are so sweet! Thank you!! These tarts are beautiful, Julie. I love that you used pineapple instead of lemon for something a little different. Happy FF! Thank you Natalie! It is definitely a nice change but we love lemon too! Thank you for such sweet comments! Thank you! You are such a sweetie! Wow, I need to go to pie school! Just look at these tarts!! I probably would never have given such a thing a second thought if I saw a recipe, now I’m just crazy to try them! Thank you! Pie school was a ton of fun. Your meringue looks so perfect, Julie! I can almost taste the pineapple cream. They look soo amazing. Thanks for sharing at FF! Thank you Andrea! It’s wonderful that you co-hosted this weekend! miss10 is obsessed with pineapples – she would love these tarts. They are so good. I’m sure miss10 would love them! Thank you for stopping over! Your valentine’s day traditions sound pretty great to me! Thank you Michelle! I loved Valentines as a child because we got to create boxes that out admirers could leave cards. I guess I’ve always been a romantic! You would love it because it’s a great time to bake! Thank you Lily! It is yummy and I try not to make it to often so it stays special. Pineapple cream – I never have tried such a dessert. Looks delicious and I am sure they were good with the crust and meringue on top! Thank you Judi! How did your Super Bowl party go? It was a lot of fun. It was the first class that I’d ever attended for cooking and It really made me seek out other ones. What special little tarts you have created for Valentine’s Day…I can see why your husband loves them. Thank you Karen! They are definitely a favorite. I appreciate you stopping by and hope you have a great weekend! Thanks Jhuls! Have a great Valentines Day! Thank you! I would sure share if I could! Have a wonderful weekend! Oh my, but these really are special. They look beautiful, and I bet they taste wonderful. This is my first visit to your site, but it certainly will not be my last! Happy Valentine’s Day to you and yours. Adri you have just made my day…my week! Thank you so much for stopping by and your kind comments. What beautiful tarts. And your meringue recipe is also worth saving for other pies. Thank you Hilda! They were very good. Happy Valentines! Wow Julie, these look incredible! 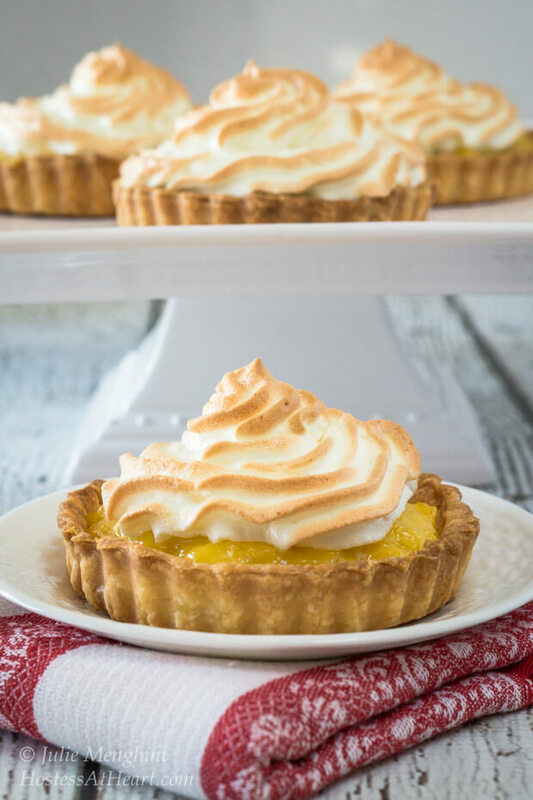 I love the idea of using pineapple in place of lemon for a twist on meringue-y desserts. Your photos are lovely! Thank you so much! They were delicious and dangerous to have around. Hope you have a wonderful Valentines Day. Wouldn’t be much of a Valentine’s Day if David and I were to cook together…lol! Even with a bottle of wine! These are so pretty! I’ve never been afraid of meringue and was just saying the other day I hadn’t made anything with a meringue in a long time. Did you have a torch to make them so perfectly browned? LOL! You and David don’t roll well in the kitchen? I brown them in the oven so it looks a bit more uniform. If only the ridges and peaks brown that’s a great indication that a torch was used. I have a little one but never use it. Thank you Dini! I’d love to have a pie class with you! This was the third time that I’d made this crust and I am finally figuring out the feel of the whole thing. Have a wonderful Valentine’s Day! Thank you Ana! I love this recipe, and John is crazy about it too. Hope you have a wonderful Valentines Day with your hubby too! Such a lovely, delicious and unexpected departure from the standard lemon! Thank you Nancy! Lemon is a loved second place pie in this house. Lovely, lovely, lovely! Happy Valentine’s Day!! Thank you Susan! I hope you have a wonderful Valentines day too! Thank you Loretta! The thing that I have found with those tart pans is that when you make a pie with meringue it starts to break down and you have the liquid in the pan. With the tart pans it is all in each individual tart which keeps them a little longer. John would eat it in any condition though. He’s whining about his shirt collar being a bit tarter but that is on his way to the fridge. Happy V-Day to you and your lover to Loretta! I love starting my day talking to you! Thank you! The first time I made this meringue I thought “you’ve got to be kidding?” It really helps with the structure though. Julie, your food is much too pretty to eat. Patty, If you could see my waistband right now you would know that isn’t the case! Thank you sweet girl! Have a great day! THANK you Josette. Such kind comments! Yum these sound awesome my twin blogging sister. It must be tart week and I think we have the same mini tart pans. Pinned and tweeted. Message me tomorrow on Hangouts. Thank you my brother! I appreciate the support! I’ll be on hangout early or later. I am meeting my daughter for brunch! I have been thinking of you and have an idea for you. Can I PLEASE be your taste tester???????? OMG. Another cruel temptation Julie! Just gorgeous and looks irresistible. Your John is a lucky man! Happy V day. PS What is AP flour? LOL! He says 5 lbs heavier too. All-Purpose flour. I will change the post to show that thank you Johanne! this is gorgeous Julie! Pie school wow awesome! What a sweet post and lovely traditions! There is the recipe for those beauties but you took me by surprise with the pineapple filling. What a wonderful change from lemon and I love the sour cream addition. It sounds deliciousw Julie and a fantastic Valentines Day treat. Thank you Suzanne! We just love them and his second favorite is Lemon Meringue.